Dior homme eau. Great smell. Doesn't smell like an orange at all! Need to get your nose checked! Nice clean, fresh scent! Smells close to the same as Dior homme. Just a little different. Recommended! Many compliments! One of my favorites. 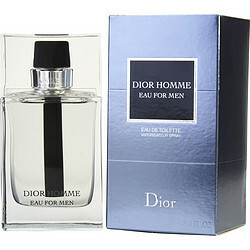 DIOR HOMME EAU by Christian Dior is a masculine scent with woody, musky and oriental notes. The scent last a very long time but is not overpowering or offensive. Both my son (24yrs) and long-term partner (55yrs) enjoy this scent and get numerous compliments when wearing it. It is definately one that will remain in our household as the go-to Fragrance for my guys!